Just a few hours ago first video song from Shaandaar was released. The song launch held at a suburban five-star hotel in Mumbai on September 10th. Event started with Shahid & Alia recreating the magic of the song live by dancing. It started with background dancers flashing their torches on to the dark stage and moved into a synchronized formation, Alia sprang on to the stage and her dance steps cheered the audience. Soon Shahid joined her on stage and both set the floor on fire! Everyone enjoyed their steps and when the song ended a voice "Once More" filled the room! 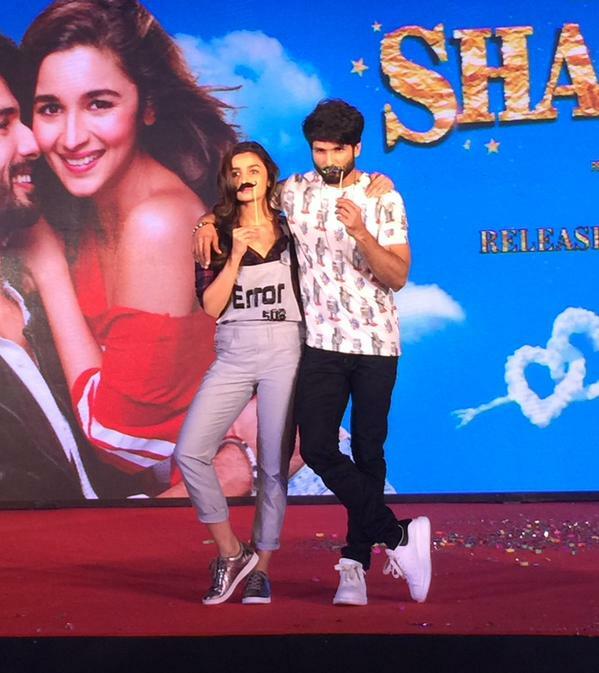 Alia shared her experience with Shahid saying "Gulaabo was our first ever song that we danced together to. I was damn nervous because I was supposed to be dancing with Shahid. Even with just 10 per cent of his dancing skills, he looks great on stage. So, I had to match up to him. I worked very hard. At one stage, I even burst out crying and Bosco (choreographer) used to say that I have penguin feet. But I have to say Shahid also helped me a lot."